This color photo of Neptune's largest moon Triton was obtained by NASA's Voyager 2 probe on Aug. 24, 1989, from 330,000 miles away. The resolution is about 6.2 miles, sufficient to begin to show topographic detail. Triton was discovered in 1846 by the British astronomer William Lassell, but much about Neptune’s largest moon still remains a mystery. A flyby by NASA's Voyager 2 spacecraft in 1989 offered a quick peek at the satellite, revealing a surface composition comprised mainly of water ice, along with some nitrogen, methane, and carbon dioxide. As Triton’s density is quite high, it is suspected that the moon has a large core of silicate rock. It is possible that a liquid ocean formed between the rocky core and icy surface shell, and scientists are investigating whether or not this ocean could have survived until now. Planets form from a circumstellar disc of dust and gas that surrounds a young star. This disc circles the star in one direction, and thus most planets and their moons orbit in this same direction. These orbits are known as prograde, and a rogue object that orbits backward is said to be in a retrograde orbit. The retrograde orbit of Triton means that it most likely did not form around Neptune. The early solar system was a place of dynamic violence, with many bodies changing orbits and crashing into each other. Triton likely originated in the Kuiper Belt — the ring of icy bodies beyond Neptune — and was sent hurtling inward until it was captured by Neptune’s gravity. Directly after capture, the moon would have been in a highly elliptical, eccentric orbit. This type of orbit would have raised large tides on the moon, and the friction of these tides would have caused energy to be lost. The energy loss is converted into heat within the moon, and this heat may have melted some of the icy interior and formed an ocean beneath Triton's ice shell. The energy loss from tides is also responsible for gradually changing Triton’s orbit from an ellipse to a circle, researchers say. Friction from tides is not the only source of heat within a terrestrial body; there is also radiogenic heating. This is heat produced by the decay of radioactive isotopes within a moon or planet, and this process can create heat for billions of years. Radiogenic heating contributes several times more heat to Triton’s interior than tidal heating; however, this heat alone is not sufficient to keep the subsurface ocean in a liquid state over 4.5 billion years. But tidal dissipation causes heat to be concentrated at the bottom of Triton's ice shell, which impedes the growth rate of the ice and effectively acts as a tidal-heated blanket. This tidal dissipation is stronger for larger values of eccentricity, meaning it would have played a major role in heating Triton in the past. "While the concentration of tidal dissipation near the bottom of ice shells was known for some time, we believe our work is the first to demonstrate that it indeed controls the rate of freezing and sustainability of subsurface oceans,"
said Saswata Hier-Majumder at the University of Maryland. "Radiogenic heating, in comparison, heats up the shell uniformly, and thus doesn't have as disproportionate an influence as tidal dissipation does." 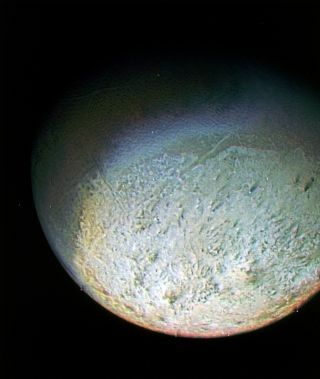 This computer generated montage shows Neptune as it would appear from a spacecraft approaching Triton, Neptune's largest moon. The exact point in time when Triton was captured by Neptune and the length of time it took for the moon's orbit to become circularized are unknown. Triton’s orbit is currently almost exactly circular. Investigating how the shape of the orbit evolved through time is important to determine the level of tidal heating that occurred, and thus if the subsurface ocean could still exist today. As Triton cools, the ice sheet will grow to engulf the underlying ocean. The new research calculates how the thickness of the ice shell can influence the tidal dissipation and thus the crystallization of the subsurface ocean. If Triton's ice shell is thin, then the tidal forces will have a more pronounced effect and increase the heating. If the shell is thick, then the moon becomes more rigid and less tidal heating will occur. "I think it is extremely likely that a subsurface ammonia-rich ocean exists in Triton," Hier-Majumder said. “[But] there are a number of uncertainties in our knowledge of Triton's interior and past which makes it difficult to predict with absolute certainty." For instance, the exact size of Triton’s rocky core is unknown. If the core turns out to be larger than the value used in the calculations, then there will be more radiogenic heating, with extra heating increasing the size of any existing ocean. The depth of the ocean also may not be constant across the moon, as tidal dissipation concentrates energy near the poles, meaning that an ocean would likely be deeper there. In addition, recent calculations estimate that icy bodies in the outer solar system could be comprised of up to 15 percent ammonia. Ammonia-rich volatile material works to lower the temperature at which a solid turns to a liquid, and the presence of such volatiles may also help a liquid layer persist beneath the ice. Jupiter's moon Europa is currently the leading candidate for such a habitat, although there is still much debate about this. The probability of life existing within the depths of Triton's ocean is much smaller than for Europa, but it still can't be completely ruled out, researchers say. The ammonia that is likely present in Triton's subsurface ocean might act to lower the freezing point of water, thus making it more suitable for life. The temperature of the ocean is still probably around minus 143 degrees Fahrenheit (minus 97 degrees Celsius), which would slow down biochemical reactions significantly, and impede evolution. However, terrestrial enzymes have been found to speed up biochemical reactions down to temperatures of minus 153 degrees Fahrenheit (minus 103 degrees Celsius). A more remote possibility is that Triton could host silicon-based life, assuming that silicon can actually be used as a foundation for life instead of carbon. Silanes, which are structural analogues of hydrocarbons, could be used as a building block for life under the right conditions. The frigid temperatures and the limited abundance of carbon on Triton could be suitable for silicon-based life, but there isn't enough known about the behavior of silanes in such unusual conditions to firmly state that such life could exist. The research by Jodi Gaeman, Saswata Hier-Majumder and James Roberts was published in the August issue of the journal Icarus.